I have a cute little geeky DIY that you can use for any occasion and customize ever so slightly to match whatever decor you are making them for. These are little wire wrapped atoms from Ruffled Blog. Depending on what you’d like to use these for you can use different colours of wrapping wire and you can also change the beads that you use as the nucleus. You can even buy some smaller beads to orbit on the wires, if you so choose, and remember, that you can add glitter to any of these with some spray adhesive and loose sparkles, so there’s lots you can do! But I’ll just give you the basics for how you can put them together and then you can let your imagination run wild. 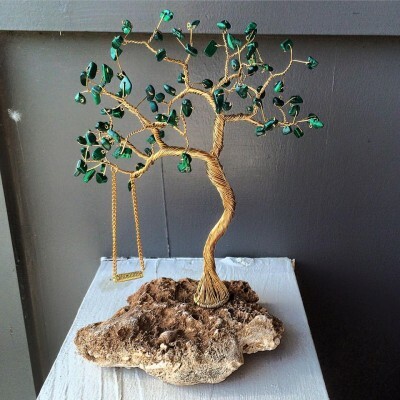 The beautiful thing is that the only things you need to make these are beads of your choice, wire of your choice and wire cutters. Your first step is to thread your wire through your nucleus bead, and wrap both ends around so that it won’t move. Start from measuring at your ring finger, and then wrap the wire around your fingers 3 or 4 times (depending on how many orbiting threads you’d like. When you’re ready, cut the wire at the back of your fingers. If you want to have any beads orbiting on these wires, you will need to add them now and move them to the different strands. At this point, you will need to gather the strands together at the mid point (where you cut your wire) and wrap the tail end of that wire around all of the strands to pinch them together and secure them. Your last step is to open the loops into an atom shape, or wherever you would like them and then to take your beginning bead and wrap the point where your loops all intersect so that they’re secure and won’t move. And it’s as simple as that, ladies and gents. Use them as decorative pieces on a table setting, or hang them from fishing wire. I hope you enjoyed this little, simple diy. While we may still have bits of snow on the ground here and there, I’ve found little hints of impending Spring popping up all over! 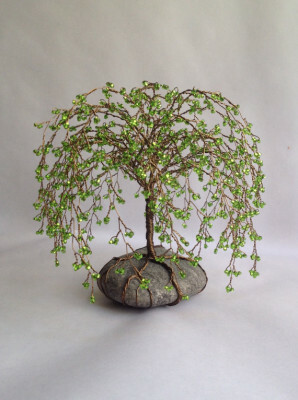 On my craft feeds there have been birds, bunnies, and flowers but more intriguing have been the budding trees. 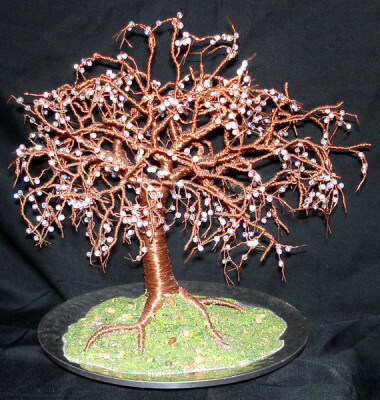 In a few particular cases, these trees contained the most fabulous sparkles because they are actually made of wire and gemstones! The crafts are alive with a hint of green leaves! 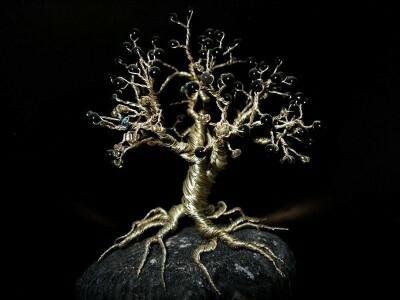 I’ve been known to play around with wire and gemstones in my jewelry making days but nothing as complicated as some of these wonderful sculptures. A tiny little wire hideaway to escape those pesky chores! I think the ways some of the artists capture movement and detail are just stunning! So lovely, I can practically smell it’s leaves blowing in the breeze. So pretty, especially if you already have a wire and bead stash! Spring cleaning and new crafts all in one! Next week I think it may be time to take a look at some of the fuzzy little critters that emerge from their winter burrows in the Spring (especially the crafty kind). See you then and stay crafty!